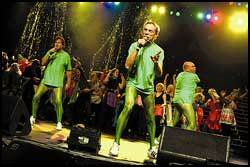 3 clowns in green tights, ridiculous faces, crazy costumes, familiar melodies and weird lyrics. Mix this together and you get PRIMA VERA. The crazy group Primavera ravaged his country in the 1970’s and 80’s. And now in 2000. For Beatles, it is over – for Monty Python, it is over, but Primavera survive. They refuse to give up. And good it is. There’s no with respect for themselves who can say that they have not heard of their parodies of familiar songs, would antics, skits or performances. Many are those who have been shocked and totally speechless at what they have heard or seen. Most were still those who thought this was really fun, and that it represented an entirely new and positive in the otherwise gray everyday life. Never before or after the three people fit so well together and complemented each other as to the degree that these three. Nevertheless, it was hard work with the great musical qualifications, which provided them the popularity they had. Jahn his amazing voice and charisma, Herodes’s great texts and Mathisen’s amazing parodies. These together constituted what became of that Primavera was a success. It was Herodes Falsk`s membership in Jonas Fjeld Rock `n Rolf Band which was the germ of what would later become the idea and the formation of the group Prima vera. Jonas Fjeld Band had little success with their first disc, and they had now decided to make a disc that was so cruel that they would be released from working with her recording label. With him as “Jodl” they would have Tom Mathisen and producer should be Jahn. Jahn was unfortunately ill before recording and Herodes Falsk produced, therefore, the disc itself. The disc was temporarily very popular and sold in fact the silver. The rest of the members of the Jonas Fjeld Band wanted to be serious musicians and not comedians. So in 1976 they parted ways with Jonas Fjeld Band and Herodes. Herodes immediately began a project in which he would make a disc with dreadful versions of familiar melodies. This idea he had of the orchestras that James Last and Kjell Karlsen. He would use the famous musicians to play. As the vocalists he thought of Jahn and Tom. Jahn and Tom was dedicated to the project, and after a while they had it so much fun together that Herodes’s solo project was forgotten, and together they formed the group Prima vera. Prima vera’s humor is simple and direct. It has taken influences from English humor: Bonzo Dog Band and Monty Python, but have little English understatement. Is there anything of the Norwegian humorist who is Dadaistic in its form, it is Prima vera. Humor is free of solemnity, it is a little pretentious. Humor, however primitive expressive. In its best moments they are ingenious fun. Prima Vera – Prima Vera -1977. Recorded 19, 20 and 21.08.1977 with the Jonas Fjeld Band as musicians in Roger Arnhoff studio. The release date was 20/09/1977. Prima Vera – Brakara – 1978. Recorded 31.07, 01, 02 and 03.08.1978 with the Jonas Fjeld Band as musicians in Roger Arnhoff studio. The disc was a great success and went to the top of the VG-list. The release date was: 01/12/1978. Prima Vera – Salmer og sanger vi gjerne hiver – 1979. Recorded 27, 28, 29 and 30.08.1979 with the Jonas Fjeld Band as musicians in Roger Arnhoff studio. The disc sold well, but was not as well selling as “Brakara”. When it came to the abum, many people confused it with a religious record. The release date was: 03/12/1979. Prima Vera – The best of Ebba – 1980. A compilation featuring the best they have done until now. In addition to that it’s a new song: “It must be a joke”. Release date was in October 1980. Prima Vera – Den 5te – 1981. Recorded 24, 25, 26 and 27.08.1981 with the group Lava as musicians in Roger Arnhoff studio. On the album Øivind Blunck contributes with the song “Up and down”. The version of the song “Coming Up” written by Paul McCartney was stopped by the songwriter, when he heard of the Norwegian text. This disc is otherwise released with three different cover. In the first release is Primavera “depicted” by King Olav V, Crown Princess Sonja and Queen Elizabeth. This edition of “The 5th” was stopped by the Attorney General. Then the disc was released with new cover. This time the parade Springtime in Green longs up Karl Johan Street in Oslo at the opening of Parliament. There are also released a version of the disc where the Primavera has gray longs. “The 5th” earned a third in the VG-list. The release date was: 12/10/1981. Prima Vera – Fisle Narrepanne i Tyrol – 1981. This is an album from the show with the same name. The show was a huge hit with audiences, but was badly criticized by the press and critics. Since the music was not even mentioned by the critics, Prima vera decided to release the music on the disc. The music was recorded within 10 days to give the same “sound” as the show. Prima Vera – Ha ha he he ho, de gærne har det godt – 1982. It was first used different musicians during recording, and a single band. Øivind Blunck also sang a song on this disc. The song is called “Just Piss”. Concurrent with the launch of the album was released a video with skits and music videos which are taken from the record. Best listing this time was a third in the VG-list. The release date was: 18/10/1982. Prima Vera – Her kommer Olavs menn – 1983. This is the soundtrach from the movie “Primavera and the saga of St. Olaf. Prima Vera – Absolute Prima Vera – 1994. This CD contains 32 songs. When the last song tones out,we can hear “sketch” The fire in the tracksuit. Prima Vera – The Prima Vera Show – 1999. This release contains 2 CDs: CD 1 is a Live CD from the ABC Theater in Oslo that Prima vera had the 12/03/1983. It is an edited version of the show. CD 2 is a bonusCD with all 32 songs. Prima Vera – Det Beste Fra Prima Vera – 2017. This product was released both as cd and digipack.